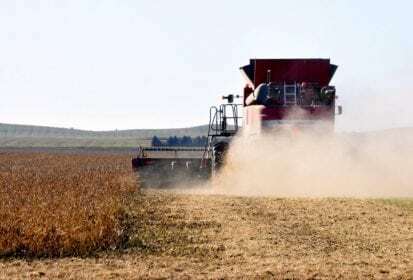 CNS Canada — Manitoba soybeans will be ready for harvest well ahead of normal, provincial pulse crop specialist Dennis Lange said, fresh from fields where he was conducting maturity ratings. He said he was out around Morris on Tuesday and some soybean varieties there are already nearing full maturity. Throughout Manitoba, farmers could be taking off their soybean crops in two weeks, if the weather holds. The size of this year’s crop remains in question until farmers can get more of it harvested, but yields are likely to go down, due to the dry summer. Lange expects yields will be about 28-30 bushels per acre on average across the province. Future showers at this point will do nothing to boost yield prospects, so downgrading factors are all that remain that might yet affect yields. Those include too much moisture during harvest, and the chances for autumn frost. Lange, who said he doesn’t conduct pod counts and instead believes he can get a more accurate count by looking at overall podding and plant stands, compared this growing season to 2011. That year, Manitoba farmers generated 26.5 bushels per acre on average, although only 580,000 acres that year were planted to soybeans. This year, Manitoba farmers planted 1.9 million acres, down from 2.3 million last year. The crop yielded 34 bushels per acre on average in 2017, about 17 per cent more than this year’s expected yield. In 2016, Manitoba soybean growers harvested a record-high 42 bushels per acre. “Sometimes longer-season varieties might have a bit of an advantage, just because they hang on a little longer,” Lange said. However, he added, if timely rain doesn’t come, it’s not going to make a difference. — Terry Fries writes for Commodity News Service Canada, a Glacier FarmMedia company specializing in grain and commodity market reporting.